In late 1959 I was Chief Engineer for Crane Carrier Canada, manufacturer of heavy duty truck chassis for crane installations. 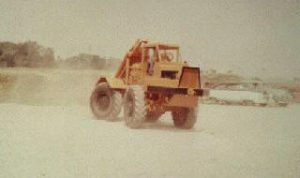 We had just completed our first 8 x 6 crane carrier chassis designed for mounting of a 35 ton crane, and equipped with tandem rear drive axles and tandem front axles, one of which was driven. We had built many smaller three axle carriers with both front and rear wheel drive so use of transfer cases to split the drive lines was familiar territory. We got an order from Timberland Equipment in Woodstock to build them a four wheel drive tractor unit capable of working in a heavy bush environment with maximum manoeuvrability. They planned to add a winch and boom for log removal out of the bush, and the inference was that if successful, there was potential for a considerable volume of future business. We were excited and put all our efforts to produce a top level piece of equipment. 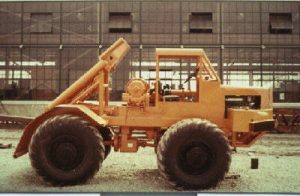 By mid summer of 1960, we had completed the unit and shipped it to the Woodstock plant of Timberland Equipment. It was equipped with a GM diesel engine, heavy duty transmission and transfer case, and Clarke planetary drive steer axles installed both front and rear. We had long been using the planetary axles on our large crane carriers, with the planetary gear reduction in the hub of the axle reducing the load requirements on the drive line and differential, and felt that it was an ideal application in this unit. The rear axle was rigidly mounted to the frame and the front axle was pivot mounted to provide rough terrain mobility. Power steering was set up so that either the front axle could be steered alone or alternately, both axles could be steered for minimum turning capability. I was very proud of that unit as it left our plant, and even more so when I visited Timberland’s plant a few weeks later to see them testing the finished log skidder before shipping it to their customer. The oscillating front axle and four wheel steer capability gave the required manoeuvrability as they ran it over the rough grounds behind their plant. However, our expectations of volume business was quickly dashed as the company, sensibly so, after completing the prototype, decided that now they had the basic design they could produce the complete unit themselves. In service, they quickly realised that in the harsh environment in which these machines worked, driving over rocks and tree stumps, the oscillating front axle design, and the vulnerable elements of the steering linkages on the axles had to be eliminated. 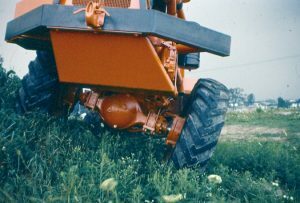 A change was made to rigidly mount two non-steering axles to the frame, and the frame was separated into two halves, connected at the centre by heavy duty pivots. This design also provided more protection to the transfer case and drive line. Steering was accomplished using hydraulic cylinders to pivot the front and rear sections of the machine horizontally. James Tudhope was an aggressive industrialist, building a thriving carriage business from that originally founded by his father in 1874. By 1902, the Tudhope Carriage Co. Ltd. factory occupied a full three city blocks in the downtown area of Orillia. 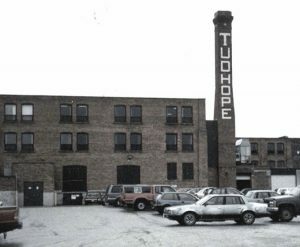 A separate company, Tudhope Anderson Co. Ltd. was formed, and used part of the existing factory to produce a line of wagons and farm equipment marketed under the name TACO. In 1907, Tudhope entered the burgeoning car business, building a high wheeled automobile that looked more like a Phaeton carriage than a car. (A mint condition Tudhope automobile can still be seen in the Oshawa Car museum.) This venture died when the plant burned down in 1909. The plant, with a carriage capacity of 25,000 units a year was rebuilt without delay, helped by a $50,000 interest free loan from the city. Although his love was carriages, and he had organised a new company under the name of Carriage Factories Ltd., Tudhope wanted to get back into the car business. He made a deal with the US manufacturer to build the Everett 30 car under license. This car, built by the Tudhope Motor Co., turned out to have design flaws in the rear axle and by 1913 the subsidiary was in bankruptcy. His Carriage Factory company had been merged with three other Ontario carriage manufacturers as Tudhope pursued his dream of a carriage building empire, but the rapidly growing auto business was overtaking him, despite his attempts to be a part of it. Striving to stay alive in the disappearing carriage business, he built bodies for auto makers along with all-weather tops to keep his factories busy. 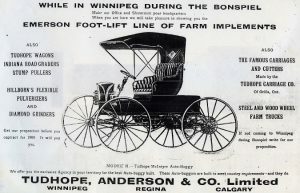 As car manufacturers began building their own covered bodies, Tudhope’s business slowed down, and in 1924, he sold his dream of an empire, Carriage Factories Ltd., to the Cockshutt Plow Co. who merged it into their Canada Carriage and Body Ltd. subsidiary in Brantford. Four year later, his farm equipment and wagon building business, TACO, was sold and reorganised under the name of OTACO Ltd, and a huge new foundry, ( now part of Kubota) was built in the outskirts of Orillia. The OTACO name continued to exist until 2007 as an auto seat manufacturer in an Orillia suburb. James Tudhope died in 1936, and despite his ventures into car building, never learned to drive one. 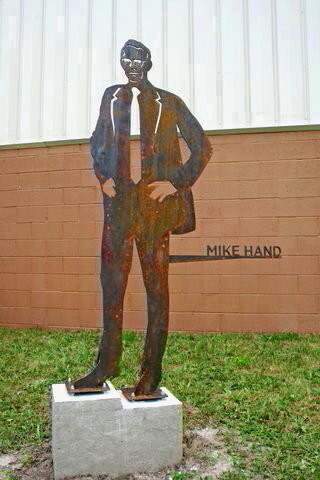 His name lives on in Orillia in a downtown park, and for many years towered over the city in white letters on the high brick chimney at the remaining part of his down town factory. In 2000, the chimney was taken down due to deterioration into an unsafe condition. I’m sure many of you are familiar with the Southworks factory store outlet mall in Cambridge, Ontario. These fine old stone buildings stand out among many in the old part of Cambridge, formerly known as Galt, around the banks of the Grand River which flows majestically through the city. 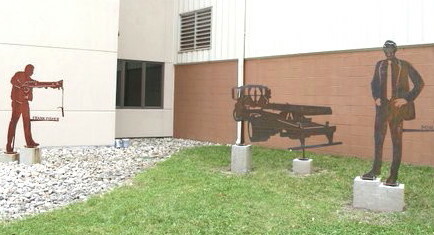 On the north side of the buildings, an old steel press mounted on a raised concrete platform provides some insight into the history of these buildings. 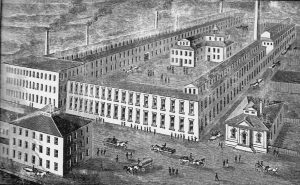 The Goldie McCulloch Company founded their business in 1859 and operated on this site for 120 years, the factory closing in 1980. From these buildings emerged huge steam engines, boilers and power plants, woodworking machinery, safes and vaults, water turbines and gasoline engines. As the company grew, the additions were always built with stone to maintain uniform appearance, including the square building between the factory and the river used mainly as a storage warehouse. As a result, we have today the wonderful old buildings forming the outlet mall. When they ran out of space for expansion, a new factory, the Northworks, was built on Hespeler Road. 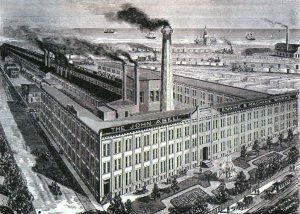 However this factory, now Babcock and Wilcox, was a more modern construction and did not have the timeless appearance of the Southworks. 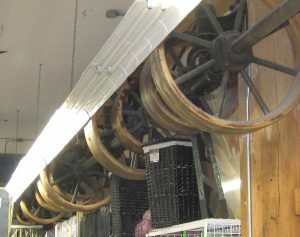 Inside, as you walk through some of the stores in the south building, the remains of old lineshafts and pulleys can be seen at the roof level. 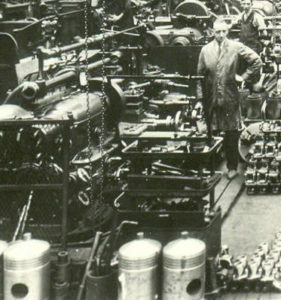 The many machine tools used in the factory to make the engine parts were driven by belts running from these shafts which obtained their power from huge steam engines in each building. In between the two main buildings are the remains of the power house where the steam for the engines and for heating the factory was generated. The west half of this building housed the foundry, where the workers spent their days on a sand covered floor building the moulds into which the molten iron would be poured to cast the engine parts. Today, it is difficult for the visitor to imagine the buildings as a noisy thriving manufacturing operation with over 200 workers toiling under conditions that would be considered less than acceptable in the modern world. Change continues. Unfortunately, today’s retailing environment has made it difficult to stay profitable and the Southworks Mall, falling victim, was closed mid 2017. It is now in process of being transformed into housing units and I suspect the remaining line-shafts will fall victim also to this change. Like many, I love to wander around the steam shows looking over the frequent displays of venerable old Ruston and Hornsby horizontal diesel engines, many thousands of which were built and shipped to all corners of the world in the first half of the twentieth century. I ‘m always fascinated by the smoothness with which they run, and almost hypnotised when I look at the rim of the huge spinning flywheel, so accurately machined that it appears stationary. 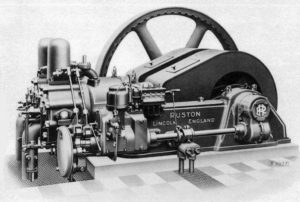 My memory inevitably takes me back to when I served an engineering apprenticeship with that manufacturer in their multiple factories in Lincoln, England back in the late 1940’s. 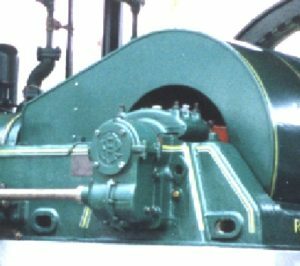 I can still see in my mind’s eye, the huge Bullard vertical lathes on which the flywheel castings, up to 72 “ in diameter, were machined on the perimeter and then at the centre for the crank shaft mounting. As part of my training, I worked on many of the machines used to make various engine parts. One of my early assignments was the machining of the huge piston castings for the horizontal engines in preparation for the finish grinding. 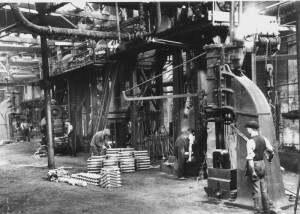 The castings were so heavy – the pistons were up to fourteen inches in diameter – a hoist was needed to lift them into the lathe. As the core of the casting mould was not always central, first operation in the lathe was to measure the variation in wall thickness and offset it in the four jaw lathe chuck so that when machined on the outside, the walls of the piston were of equal thickness all around. If the core was out one quarter of an inch, it meant that the first roughing cut on the outside could be as much as half inch deep while minimal on the other side. After machining down to within .020” of finished diameter, the piston ring grooves then had to be cut. If the centring of the piston was not done accurately enough, one could find the ring groove tool penetrating through the piston wall on one side – a sure way to bring the foreman’s wrath down on one’s head. The final operation was to machine the convex shape of the head to match a template, honing one’s skill at simultaneously moving the cutting tool in two planes to obtain the right shape. 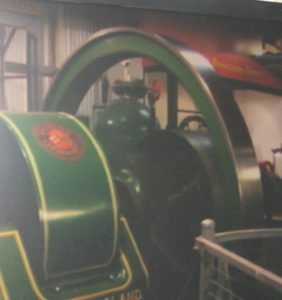 The engine side shaft operating the valves on the Ruston horizontal engine is driven by two to one ratio spiral helical gears on the end of the crankshaft. The gears are enclosed in a cast-iron housing, three pieces bolted together. One of my jobs for a while was to machine the end cap hole and the shaft bearing hole after the housing parts had been milled, drilled and bolted together. As I look at the restored engines, I often wonder if I am looking at pistons or gear housings that I machined myself many years ago. 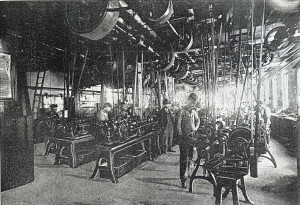 Over the last century, great steps forward have been made in the working conditions in factories. In the latter part of the 1800’s, safety concerns were virtually non existent with hazards like high speed belts and pulleys all over the place, no ear, hand or eye protection and poor heating in winter. In one of my books, From Wagon to Trailer, I recount an interview with a man who started work in the factory in the early 1930’s when conditions still did not seem to have improved too much. He told of a man fatally injured when his coat got caught in a line shaft driving the belt pulleys and was spun round and round until the drive could be shut off. And of the painters who worked all day over large paint tanks dipping the finished product with no fumes protection. In the mid twentieth century a well-known novel writer, Thomas B Costain, wrote about a young man growing up in an industrial city in his book “Son of a Hundred Kings”. It is well accepted that the city he based it on was Brantford and the young man’s experiences when first working at a foundry, also accepted as that of the Buck Stove Company, described graphically the conditions under which they worked in the latter part of the 1800’s. Even in the 1940’s, when I served a five year engineering apprenticeship with a large engine manufacturer, many of the working conditions encountered would be totally unacceptable today. One machine on which I worked doing finish machining on compressor crankshafts, required a constant stream of cutting oil to run on to the workpiece. At the end of the shift, the full height leather apron I had to wear would be soaked in oil to the extent that every night, it was cleaned with trichlorethylene to remove the oil before the next day’s use. In the forge adjacent to that machine shop, so much soot covered the windows,lights and floor that it was very difficult to see what was going on until one’s eyes adjusted to the dim light. Minimal eye protection was used and hearing protection was zero. 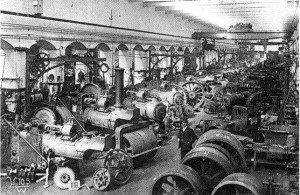 Even in a relatively clean place, as in this 1880 factory building steam engines, most times the work area would be so crowded that it became hazardous. Today, health and worker legislation is such that one could no longer find such conditions in most of the advanced nations. In contrast, one factory that I recently wrote about had some of the best working conditions that I have ever seen, and I have been through hundreds of plants in my time. The plant was fully air conditioned, most of the machinery was computer controlled, and the walls and floors one could literally eat off. No, this was not an electronics manufacturer, but a company machining metals and making special assembly machines and tools. A big step from the “good old days”. At the front entrance to a modern factory in New Jersey stand three statues. These are unusual in that they are made of a special steel that forms a rust colored coating that protects them with no further treatment. These were cut by a computer controlled plasma cutter with the images downloaded from photos to the computer. They depict one of the founders, recently retired Frank Fisher, a view of the truck container transfer unit, and the system equipment designer, Mike Hand. Through the 1960’s, I was involved in the early development of containerisation, first as Chief Engineer and subsequently as General Manager, of Steadman Containers Ltd. The company was a leader in Canada in manufacture of ISO containers and of container handling equipment, with systems for use in trucking and for road-rail transfer of containers. The Trucktainer system was licensed into the USA through General American Corp. and built and sold by Truck Container Systems of New Jersey. When the owner, Carl Winston died, the company was run by his son for a few years and closed. The plant manager of that company, Frank Fisher, partnered with a young marketing graduate, Rustin Cassway and formed a new company to carry on the business in 1989 under the name Demountable Concepts Inc. headquartered in Glassboro, NJ. This company successfully builds and markets the Trucktainer system equipment, originally designed in the early 1960’s, throughout North America and Mexico. Following the company’s twenty fifth anniversary, the president, Rustin, had these statues made and installed to honor the occasion. Visiting the plant at that time, I was present when the statue of myself was cut when I pressed the switch to start the machine. It was one of the greatest honors of my career and life, to be recognised in this way as the “father” of their equipment and to see it still made and used internationally after 50 years. As a kid growing up on a farm in England in the early 1940’s, one of our chores before leaving for school each morning was to fill a 100 gallon tank with water using a hand pump that drew water from a well. You know how many pumps that took? My father would then carry water in pails to the milk cows stalled in the milk shed. Cows drink a lot of water and each required several pails during a day. In 1943, a deep well was drilled outside between the house and the milk shed, giving us a fast flowing source of good water. The well indeed supplied water at such a pressure that from a hose, it could shoot it over the house! Complaints from nearby farmers that it was running their wells short resulted in father capping the well with a tap, solving the problem and avoiding wastage. The water was instead piped as needed to the house and other buildings on the farm. One day shortly after this, a man arrived and installed “drinking bowls” at each stall in the milking shed. Our daily chore of pumping water was suddenly eliminated. Yeah! The bowls were, to a boy’s eyes, a marvellous invention. The cow merely had to put its muzzle into the bowl to drink its fill. The pressure of its nose pushed back a flap that operated a tap allowing water, piped from the well to the shed, to enter the bowl, stopping when the animal removed its nose from the bowl. The name cast into the bowl was one that I had never heard of- BEATTY. Many years later I was to become familiar with this company which was in Fergus, Canada, a world away from a small farm in Eastern England. In Fergus, Beatty was a huge company making everything you needed on a farm, later becoming one of the pioneers and major manufacturers of washing machines. Drinking bowls was one of the more successful items that it exported. Read more about the Beatty Company in my book Where Did They Go. 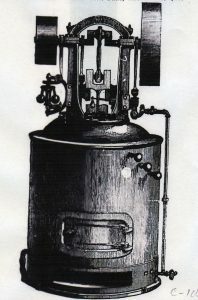 The early pioneer equipment manufacturers were never short of ideas to incorporate into their products. 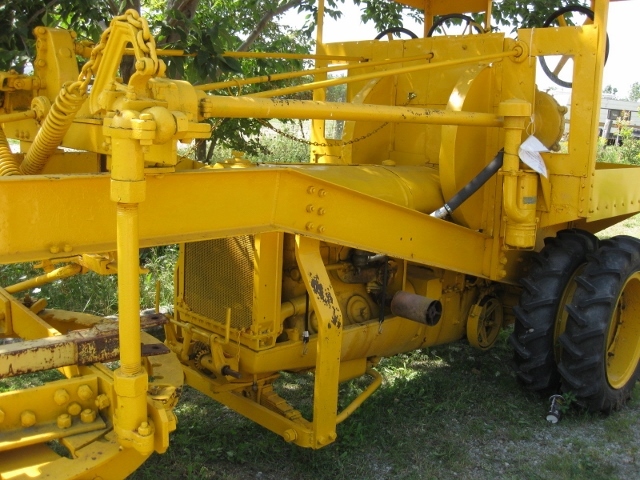 Take, for example, this early 1920’s road grader made by the Sawyer Massey Company of Hamilton. Prior to this, graders were primarily pulled by horses, or later by steam rollers, an arrangement that was not only cumbersome but limited in its capability. How to make one with its own power was their problem, unable to develop their own power unit, transmission and drive axle. 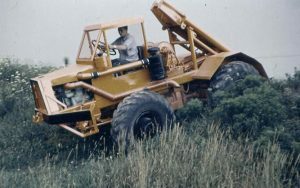 What evolved was quite original and effective, and although the concept was only used for some ten years in production, it enabled them to take grader development to the next stage. A standard farm tractor, whose development had reached the stage where they were no longer huge gasoline engine conversions of a steam traction engine, was built into the rear portion of the grader. 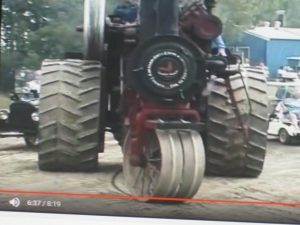 With the rear wheels and drive axle left in place to power the grader, the front axle of the tractor was removed and replaced with a supporting bracket. 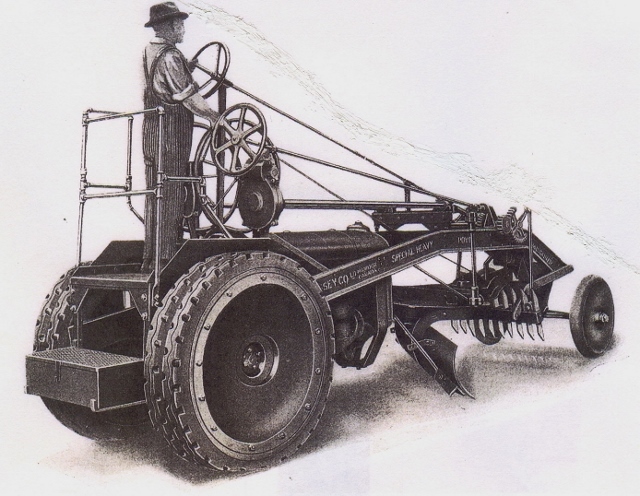 Initially, a Fordson tractor was used, as shown above, and later a McCormick Deering tractor, a product of the International Harvester Company took its place. 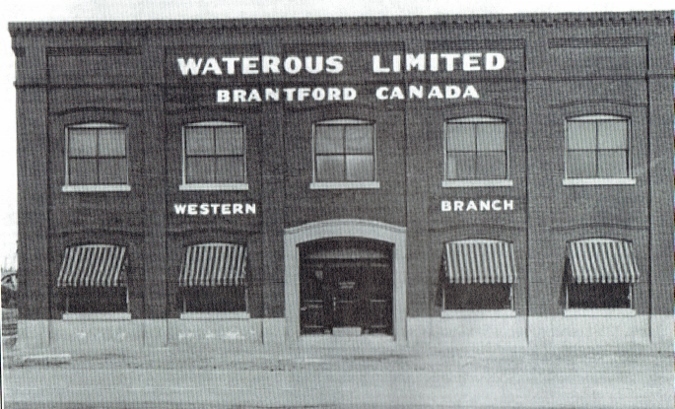 The Winnipeg branch of the Brantford based Waterous Company opened in 1883 to market its products to the rapidly opening Western part of Canada was, by 1929, passed by the growth areas of the country. The action was now further west in the far Prairies and Alberta and it was decided to move their Western Sales operation to Edmonton. 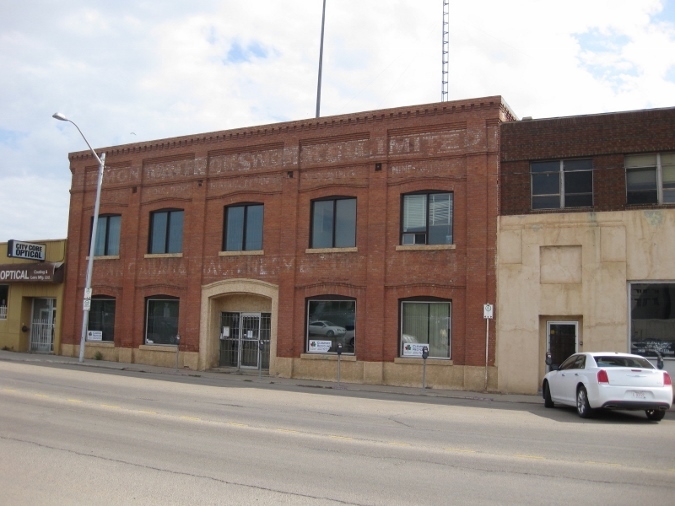 A suitable property, formerly operated by Edmonton Iron Works, was found on 96th Street. It was purchased, including machinery, for $60,000 and the Winnipeg branch was closed down and operations moved to Edmonton. Used mainly for sales and service, some manufacturing was later added. 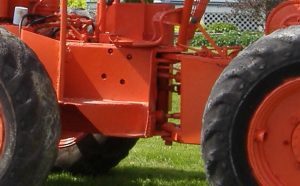 A Western sales franchise for Allis Chalmers was added about ten years later and profits from this part of the operation helped the parent company through after the 1930’s depression. When Waterous Limited finally passed out of family control in 1947, and subsequently became part of the Koehring Company, the Edmonton and Calgary branches were sold to the Wajax Corp. by the new owners. On a recent trip to Edmonton, I made a point to find the building, and such were the surroundings, I did not feel too comfortable climbing out of my car and walking the street to take a photo. The plant, now used for warehousing, still stands near the downtown area of Edmonton in a run down industrial area where most of the surrounding buildings have been knocked down and turned into parking lots. It is no longer a prosperous looking area although some construction of new buildings is evident. Although the photographs show little change in the front of the building, the remains of over 100 years of painted on name signs applied by subsequent owners can be seen, giving the building a well used and somewhat historical appearance.